Apologies for the break from posting. 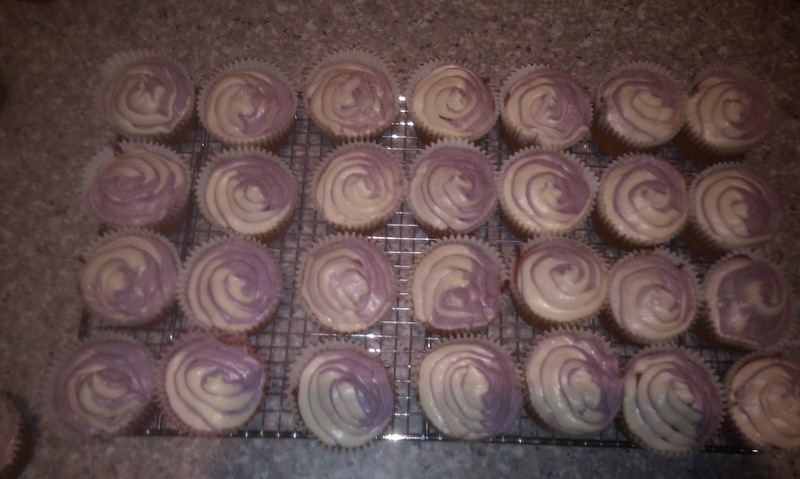 Have managed to get myself a Christmas job and so sadly the baking has gone back to part-time! Have spent hours today churning out 46 cupcakes (a triple batch) so that the Other Half has something to festive to take into the office tomorrow. So I went through my recipe books and found a recipe for candy cane cupcakes! Now as you can see from the photo I veered away from the traditional colour combination of red and white. This is because I've been trialling a new red food colouring. Natural colouring so no E Numbers, no alcohol and completely vegetarian. 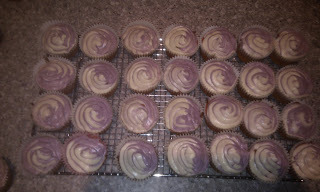 However when I tried to use it to make red sponge, I didn't get the colour I wanted, so went with a more quirky purple! The recipe uses a basic vanilla cupcake recipe for its base, and the icing is a standard frosting with the addition of peppermint essence. So they're really easy to turn out and add a little festive feel to your baking. For the best results, sprinkle with edible glitter! Mine being dark red wouldn't have worked but I encourage you to try it. What do you think? Festive? Spoon the batter into the muffin cases. Don't fill any case more than about 2/3. This amount should produce 12-16 cupcakes. Bake in the oven for 18-20 minutes, until they are well risen. Leave to cool in the tray for a few minutes before putting on a wire rack to cool completely. Make sure they are done cooling before icing. Gradually add the milk and slowly mix until everything is incorporated. Then turn up to high speed and beat until light and fluffy. Fill a piping bag (or whatever icing tools you have available) with half red and half white icing. Try to arrange it so that the two colours sit side by side and do not blend. Pipe a swirl and the colours should line up like a candy cane!